Certificate Curriculum and Agenda - ESCALA Educational Services Inc. The Certificate in College Teaching & Learning in Hispanic Serving Institutions is a 27-hour course designed for Hispanic Serving Institution faculty. This course is unique in that it provides faculty with an opportunity to work with other HSI faculty and have long-term facilitated conversations with coaches that help them reflect on how they are doing with all students and complete an inquiry in their classroom in order to improve student engagement and learning. The Certificate is delivered in two parts. The first component is a three-day summer retreat where faculty come together in either New Mexico or California to study their own identity as professors, patterns in their teaching, their institutions' norms, and learn more about Hispanic Serving Institutions as a whole. The retreat is fast paced and lively-faculty are required to bring data, actively participate in demonstrations of culturally responsive teaching, and come up with a solid plan for an inquiry project in a course they are teaching in Fall. Why is it important to be a culturally-reflective, cognitively-aware, data-driven instructor in a Hispanic Serving Institution? What is "culturally responsive/validating" teaching and what does it look like in my disciplinary area? What is 'learning equity' and how can I measure it when I record my course assessment scores and grades? How can I deliver and organize material in a way that is cognitively engaging and teaches students how to learn without sacrificing too much key content? How can video help me measure student engagement, depth of learning practice, and identify strategies that are working and not working in my own classroom? A tablet, laptop or cell phone that can access the Internet. After completing the summer retreat, faculty have the option to continue working with an ESCALA faculty coach and earn the Certificate. 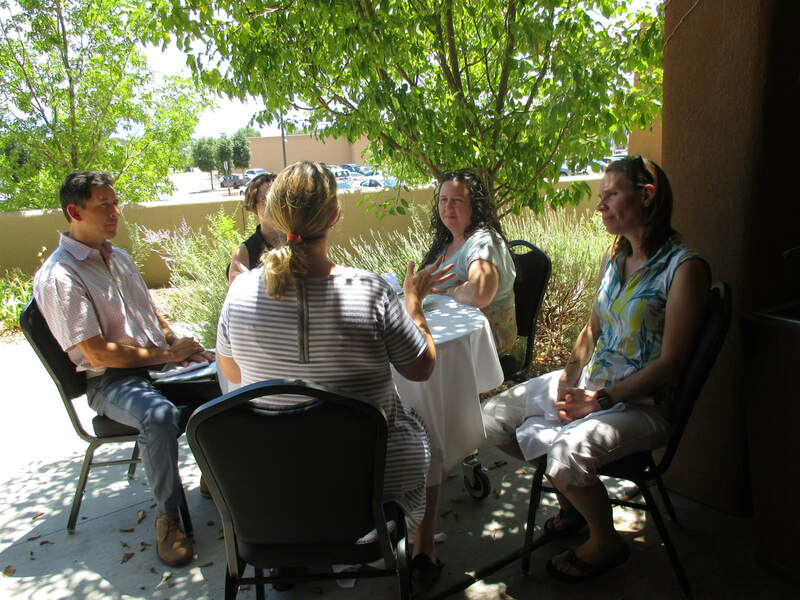 Attend a 3-day summer institute in NM or CA, where you will plan a classroom inquiry project to improve student learning in a Fall course. Present/listen to findings of your coaching team's teaching/learning projects (3 hours, using Zoom Meeting). We end the Institute every day at 4:30 so participants have time to enjoy cultural activities, sightseeing, and get to know their new colleagues. At the Santa Fe Institute, participants are centrally located to explore the unique cultural heritage of the Rio Grande Valley of northern New Mexico: the famous Chimayo red chile valley, Anasazi cliff dwellings, as well as enjoy Taos and Santa Fe's many cultural attractions and restaurants. Read more about things to do in the Santa Fe/Espanola/Taos area.